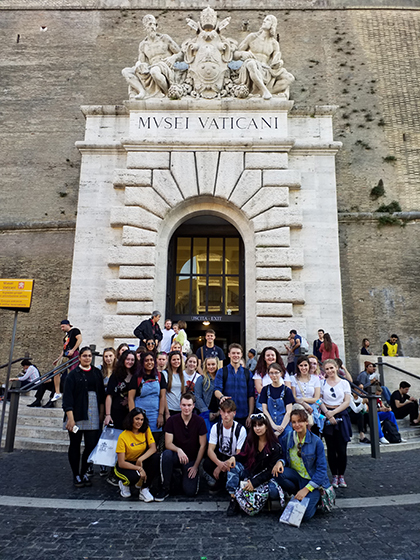 Visual Arts students at The Sixth Form College, Solihull spent half-term in the beautiful cities of Rome and Florence in Italy, visiting the many museums and galleries and taking in the architecture of the city. Students from our A level courses in Fine Art, Graphics, Photography and the BTEC Art & Design course went on the trip to experience first-hand some of the most renowned and celebrated artists in history. Their experiences will serve as inspiration for their own creations. In Rome, the students visited La Galleria Nazionale and the Vatican; the latter included the famed Sistene Chapel. They took in a light and sound show by Onionlab at the Pantheon one evening and visited some of Rom’s most famous landmarks, including the Forum, the Spanish Steps and the Trevi Fountain. During a day trip to Florence, the students visited the Gallerie degli Uffizi and the Galleria dell’Accademia, where they saw famous works of art by Caravaggio, Da Vinci, Botticelli and Michelangelo’s most celebrated piece “David”.